Background : Served as SPIKEN; true name HUGH McLEAN. Enlisted with date of birth 7/10/1902 and birthplace as Perth as part of his alias. His birth certificate proves he was born 07/10/1901 at Noorat, Victoria. Son of John and Mary Ann McLean, of Noorat, Victoria, Australia. Brother of Annie Bailey, of Noorat, Victoria. 13/05/1941 Taken on strength Recruit Reception Depot Royal Park, Victoria. 17/05/1941 Granted leave without pay 17/05/1941 to 19/05/1941 inclusive. 20/05/1941 Rejoined unit from leave. 23/05/1941 Transferred from Recruit Reception Depot Royal Park, Victoria to Engineering Training Depot Puckapunyal, Seymour, Victoria. 24/05/1941 Taken on strength Engineering Training Depot Puckapunyal, Seymour, Victoria. 16/06/1941 Add next of kin as Anne Bailey. 23/06/1941 Transferred to Pioneer Wing Engineering Training Depot Puckapunyal, Seymour, Victoria. 08/07/1941 Posted to 3rd Reinforcements 2/2 Pioneer Battalion Puckapunyal, Seymour, Victoria. 03/09/1941 Embarked Sydney, New South Wales on H.M.T. G.G..
23/09/1941 Disembarked Middle East to Pioneer Training Battalion. 26/11/1941 Marched out from Pioneer Training Battalion to 2/2 Pioneer Battalion, Middle East. 27/11/1941 Taken on strength 2/2 Pioneer Battalion from Pioneer Training Battalion. 01/12/1942 Reported missing in action believed prisoner of war. 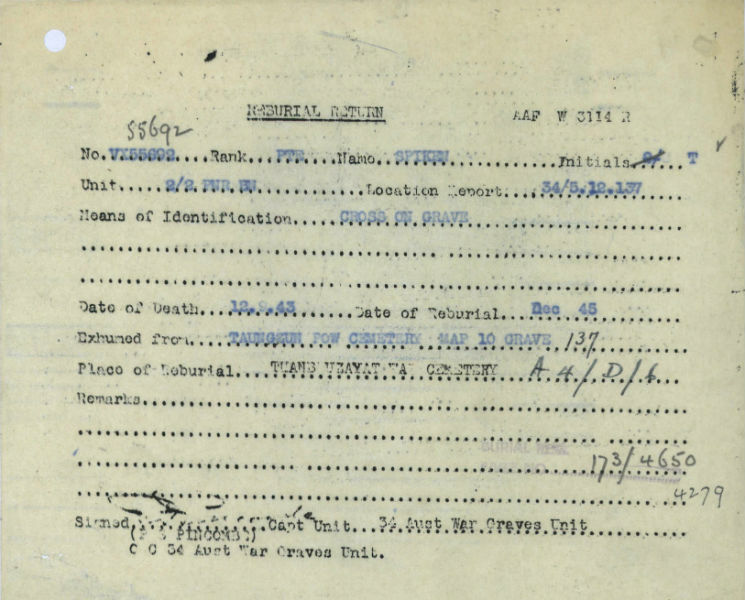 13/12/1943 Reported interned in Thailand prisoner of war camp and transferred to Thailand camp. 22/12/1943 Reported interned in Thailand prisoner of war camp. 26/04/1945 Believed died of illness (Dysentery) whilst prisoner of war (Burma). 25/07/1945 Died of illness cause not stated whilst prisoner of war 12/09/1943.